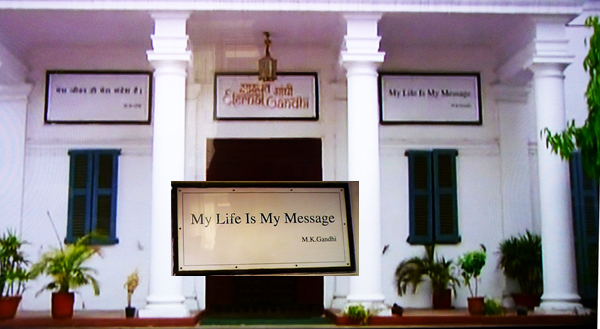 The words ‘My life is my message’ are very well-known in India and are inscribed on Mahatma Gandhi’s tomb and in front of Birla House where he lived his last days. Sathya Sai Baba expropriated this statement as his own and blazoned it all over his ashrams in an attempt to raise his own name and profile above the Father of the Nation, Gandhi. In this he failed very signally, as subsequent surveys of who were the greatest Indians showed (see ‘Greatest Indians since Gandhi’ further down). Sai Baba descried all who aimed for name and fame, but he was surely the very greatest culprit in this himself as proven here. “Once, while Gandhi’s train was pulling slowly out of the station, a reporter ran up to him and asked him breathlessly for a message to take back to his people. Gandhi’s reply was a hurried line scrawled on a scrap of paper: “My life is my message. It is a message which does not require the vast stage of world politics, but can be put into practice here and now, in the midst of daily life.” (p. 140 in “Gandhi, The Man, The story of His Transformation” by Eknath Easwaram, US, 1997, Nilgiri Press), It is further evidenced in the Gandhi Museum in Old Delhi, see here. The Greatest Indians since Gandhi nominated – & Sathya Sai Baba? An Indian web site conducted a large-scale survey to determine who is in India enjoys the greatest popularity and influence, who have made the greatest contribution to the history of the country. An initial list of 50 candidates included many prominent Indians, including many no longer alive, freedom fighters, politicians, businessmen, artists and spiritual leaders. In no category at all was Sathya Sai Baba nominated, though Mother Teresa and Iyengar were listed. Despite his own claims to have done the greatest ever service to mankind – 1000 times more than anyone else – he was not even mentioned on any of the greatest Indian lists which subsequently sprang up on in the Indian media and on the Internet! Gandhi himself was embraced as the Father of the Nation because he first motivated the masses to seek independence. However, almost everything Gandhi preached is totally disregarded in India today and his influence on the development of India is considered virtually nil by the vast majority of Indians. This entry was posted on March 19, 2016 at 12:03 pm	and is filed under Sathya Sai Baba. Tagged: Birla House, Mahatma Gandhi. You can follow any responses to this entry through the RSS 2.0 feed. You can leave a response, or trackback from your own site.